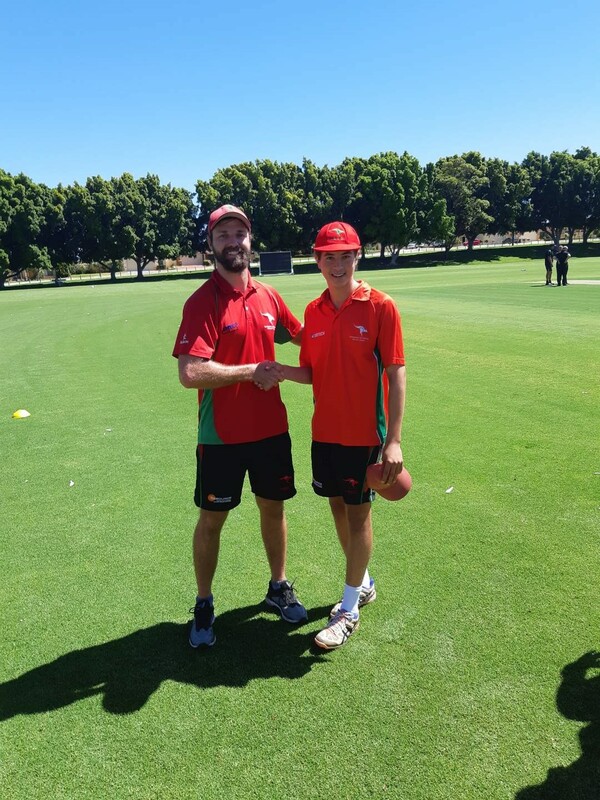 After a great first half of the season in 2nd Grade (11 wickets at 26.27), and fresh off a stint representing WA at the National 19s Championships, Deon “Lando” Billington has been selected to debut for Wanneroo DCC 1st Grade vs. Subiaco Floreat at Kingsway 1 on Saturday 6th January 2019. Much like Chad Hitchcock returning from a trip to Bali, our Seniors suffered the dreaded post-Christmas “Brown Roo”, losing all four games to Subiaco Floreat. Our 15s were the shining light in an otherwise devastating weekend, which also included the Colts being defeated in their T20 Semi Final vs. Scarborough, and our Female team being rolled for 30. Batting first at Kingsway 1, the Roos were carried to 213 by a magnificent 108 not out by new skipper Travis “Ernie and” Birt. Despite some early breakthroughs, our bowlers couldn’t stop two big partnerships of 95 and 79, led by Cameron Green. Subi chased down the runs with 2.5 overs to spare and seven wickets in hand. The outfield at Floreat Park hadn’t been mowed at all in 2019, and possibly longer, which made run scoring difficult for both teams. WDCC posted 7/184 with Graeme “Rowan” Atkinson (41) top scoring. As mentioned previously, Chad “The Chad” Hitchcock was also involved in some runs. In reply, Subi timed their run chase well and won with four wickets in hand and 11 balls remaining. Losing the toss at Kingsway 2, 3rd Grade were banished to the field. Despite reducing Subiaco Floreat to 4/46, a middle-order partnership took the visitors to 168 from their 45 overs. In reply, Wanneroo looked to be mirroring the Subi innings after slumping to 4/46, then rallying behind Tim “James” Bond (41). Unfortunately the Roos went down amidst a flurry of wickets, being dismissed for 156. The “Al Gores” started well with the bat, grinding out 53 for the first wicket, then a further 40 for the 2nd wicket. Liam “KP” Carroll (46) was the top scorer, falling just short of a half-century. With some solid contributions from everyone, the Roos posted 5/162. In reply, Wanneroo looked to have the upper hand for most of the game before Subi put on 40 runs for the last two wickets to burgle the game with 1 wicket in hand. It was an early morning massacre at Kingsway 2, with our 17s being dismissed for just 84. Just as parents began to pack up their camping chairs, Harrison “Kanheski?” Kepinski (3/14) and Sam “Venus” Williams (3/7) turned up the heat and came within one heartbreaking wicket of a surprise victory. Unfortunately it wasn’t to be and Subiaco Floreat scored the winning runs with one wicket in hand. Undoubtedly everyone’s favourite team this weekend, our 15s triumphed over Subiaco Floreat by three magical runs! Batting first, the Roos were led by Connor “Big Spang Theory” Spangenberg (46), with contributions of 36 and 32 to Jaymin “JP” Patel and Jack “J-Mar” Maraldo respectively. Subi lost early wickets, and struggled to recover despite a 43 at almost a run a ball by their opener Duncan Bent. Wanneroo triumphed by three runs, with all bowlers contributing to the sweet sweet victory. Batting first at Abbett Park, our Colts posted 114 around Riley “Buddy” Holly (41) and Caiden “Slug” Eaton (39). Scarborough got off to a flyer, with opener S Moylan posting 50 off 43 balls. Our Roos couldn’t claw the opponents back, and lost by seven wickets with 3.4 overs remaining. We batted first with only Eva “Wiltshire” Salisbury showing good resistance before being run out for 10. Girls showed strength of character but loosing significantly to a much older and stronger side chasing down our score of 30 without losing any wickets. Onwards and upwards and plenty of learning from this morning. From everyone at Wanneroo DCC, Merry Christmas and Happy New Year! The first games for 2019 will be of the one day variety, against Subiaco-Floreat. On Sunday our Female cricketers will take on South Perth, and our Colts will take on Scarborough in their T20 Semi-Final. Congratulations to Wanneroo DCC’s Aryan Varsani on his selection in the 2018/19 WA Under 15s team! The team will compete in Brisbane and the Sunshine Coast in February. There was plenty of action over the weekend, with our Premier T20 and Colts teams playing a blockbuster bonanza of cricket on Saturday and Sunday. Meanwhile, our Mens & Women’s 17s & 15s flew the Wanneroo flag with gusto. Batting first at Abbett Park, Haydn “Slods” Slodecki shone with the bat as his 44 carried his team to 117. Unfortunately the Roos were on the receiving end of a Hardy-Boyle combo who blasted 60 and 54 respectively and reached the runs with nearly four overs remaining and 8 wickets in hand. After some blunt words with the Man in the Mirror, our Roos put in a strong showing with the bat against Gosnells, with Haydn Slodecki backing up his Saturday effort with 60 off just 35 balls. Slods was supported well by Kyle “What’s that Funk?” Millar (38). In reply, Gosnells looked dangerous early but after some serious grinding from all our Roo bowlers we emerged triumphant by 10 runs. Mirroring the Premier T20 results, the Colts lost to Scarborough on Saturday before triumphing on Sunday against Gosnells. Stars of Sunday were Matt “Anthrax” Spoors (68), Riley “Buddy” Holly (32 and 2/14) and Darcy “Use The” Forssman (2/12). Our Lady Roos headed down to Lark Hill to take on Rockingham. Bowling first, we restricted the Mariners to 3/115 off their 20 overs with strong contributions for all nine of our bowlers. With the bat we struggled early until Emma “Castaway” Wilson (20) and Kristin “Indiana” Jones (14) provided some middle-order resistance. Unfortunately we were dismissed for 97, 18 runs short. Batting first at Kingsway, our 17s were led by Tim “Marcus” Harris (59) as we posted 5/126 off our 20 overs. In reply, Sharad “Sharon” Jessani (2/15) and Hayden “Stumpy” Stumpers (2/9) broke the Rocky top order and eventually restricted the Mariners to 9/69. Our 15s suffered a nasty batting collapse, with only Jack “Jack” Maraldo (33) reaching double figures. In reply, Rockingham-Mandurah ground out the win with 3.5 overs remaining and 7 wickets in hand. Connor “Spanners” Spangenberg was the pick of the bowlers with the Richie Benaud-esque figures of 2/22. • Ella Stewart who has been selected in the WA Female U15 State Squad 2018/19 to play in the Cricket Australia National Championships in Canberra from February 20th-26th 2019. Well done also to Kristin Jones who has been named as an emergency for the same Championships. • Grace Tomkinson for selection to represent WA School Sport U12’s at the National Championships in Bunbury, December 12th – 19th 2018. Look forward to seeing all of our State Representatives at training in the weeks ahead. This weekend our Premier T20 and Colts T20 teams play Scarborough and Gosnells on Saturday and Sunday, whilst our Female Youth League, 17s & 15s play Rockingham-Mandurah. 1st Grade suffered a nasty batting collapse, falling for just 113 chasing Willetton’s 158. Jack “Kym” Cattrall (3/26) and Caiden “Slug” Eaton (3/29) were our best performers. 2nd Grade could only muster 135 at Kingsway 1, with Mike “Sports Award” Ardagh top scoring with 41. In reply, Willetton passed the total with five wickets in hand, before eventually being dismissed for 195. Mathew “Doz” Dzodzos took 5/73. The game was called at tea after Allan “Dead Runs” Hall and Bailey “George” Nylander saw off any danger of an outright defeat. In 3rd Grade, Jordan “Katie Price” Slattery shone with 5/15 as Willetton was bundled out for 123. The Magees chased down the runs with four wickets in hand, with Jack “Old” McDonald top scoring with 51, supported well by Mitch “Junior” Slatter (43) and Jimmy “Loves a 40” Dicarlo (41). 4th Grade went down to the wire, with our young Roos winning by two wickets chasing 154. Bowling honours were shared with three wickets apiece to Leigh “Leeroy” Millar (3/37), Jared Maunder (3/35) and Sam “Robbie” Williams (3/27). Tom “Pullmyfinger” Pullinger top scored with 51, supported well by Liam “Christmas” Carroll (40). Our 17s restricted Willetton to 168, with bowling honours shared. The runs were passed with 5 wickets in hand. Lachie “Hendo” Henderson led the way with 49, supported well by Sam “Take That” Williams (44). Our Roos went down in their first T20 game of the season, after posting 8/113. Haydn “Glorious Chest Rug” Slodecki top scored with an undefeated 43. Midland-Guildford chased down the runs with six wickets in hand. The Wanneroo Colts tasted sweet victory, after posting 3/117 with Caiden “Slug” Eaton top scoring with 39. In reply, Riley “Buddy” Holly took an amazing 6/10 to dismiss Midland-Guildford for 109.